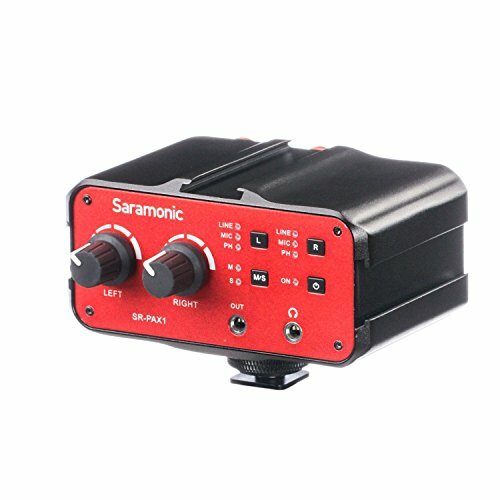 The Saramonic SR-PAX1 is a two-channel audio mixer with phantom power, specially designed for mirrorless digital camera, DSLR camera and camcorder with a microphone jack. It is ideal for recording professional quality audio from two sources and mixing them into your camera. With two sets of inputs, the SR-PAX1 accepts signals from a wide variety of mic or line level sources such as balanced XLR microphones, wireless microphones, guitars, or any musical instruments with a 6.35mm connector. The 3.5mm inputs are also ideal for connecting audio devices with a 3.5mm output such as a smartphone or an MP3 player. The input levels of each channel can be easily controlled with the dual control knobs. A phone jack allows you to monitor the audio in real time. The SR-PAX1 makes your recording work much easier.